The only way to reverse declines in labor participation and stagnation in wages and demand is to make it easier to start enterprises and hire people. 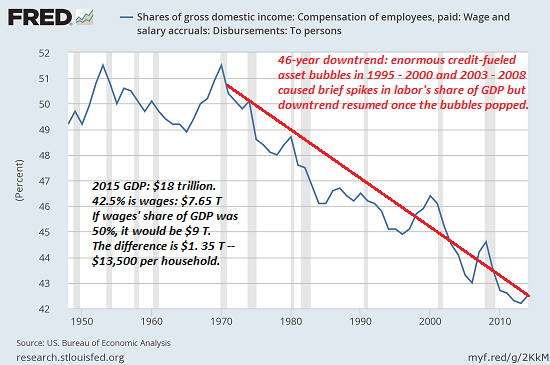 Mainstream economists are mystified why wages/salaries are still stagnant after 7+ years of growth / "recovery." The conventional view is that wages should be rising as the labor market tightens (i.e. the unemployment rate is low) and demand for workers increases in an expanding economy. But wages are only rising significantly for the top 5%, while workers between the bottom 81% who have seen their household incomes decline and the top 5% are experiencing stagnant earnings. We can see how the top 5% have pulled away from the bottom 95% by examining household budgets: spending by the top 5% has soared compared to the stagnant spending of the bottom 95%. 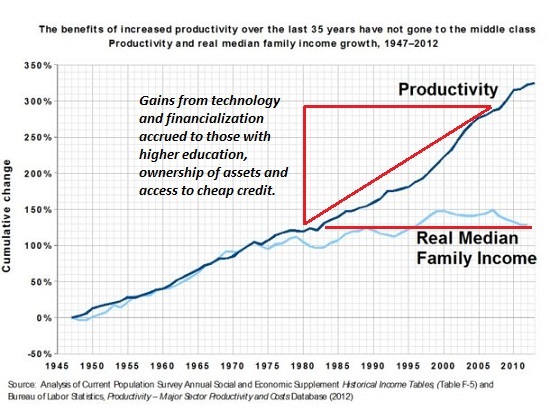 In effect, productivity gains have accrued to the top 5%. This chart shows that while productivity has advanced, household income has remained flat. Conventional economists look to labor market supply and demand for answers--and have come up empty. They can't explain why labor supply--people of working age that are actively in the labor force--keeps declining in a growing economy. They are equally flummoxed by stagnant demand for goods and services: in an expanding economy, rising demand should spur higher demand for workers that should eventually push wages higher. These higher wages should attract non-participants to rejoin the labor force and fuel higher demand for goods and services. Instead, people are dropping out of the labor force, wages are stagnant for all but the top layer and demand is weak as well. 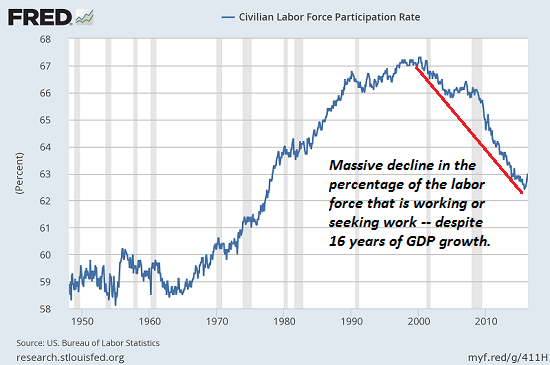 This creates multiple serious long-term problems for the U.S. economy: if fewer people are working, wages will continue to decline as a percentage of the economy, which is precisely what has been happening for decades (see chart below). If earnings and household incomes for the bottom 95% stagnate, these households cannot afford to borrow and spend more money--and that's why demand is tepid except when the purchases are financed at 0%. 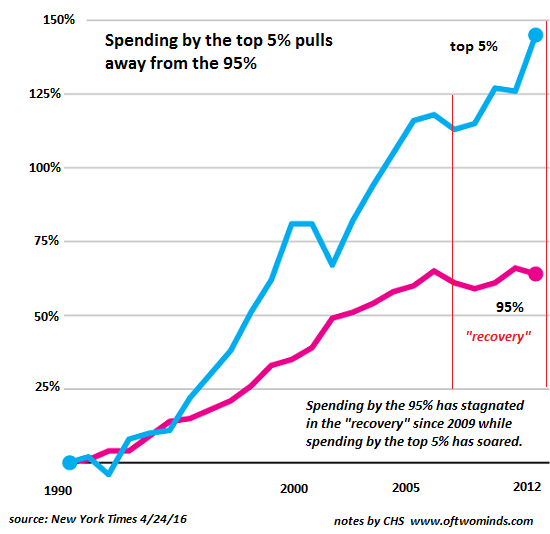 If the top 5% garner most of the productivity gains, their spending must support consumption. That's a much shakier foundation for demand than 80% of the households participating in wage gains. 1. Consider the systemic impact of energy and EROEI (energy returned on energy invested). 2. Consider the systemic impact of fast-rising private and public debt. 3. Consider the systemic impact of rising inflation resulting from state-cartel capitalism; the only possible output of state-cartel capitalism is a higher cost structure for' the entire economy. 4. Consider that consumption is exhausted because everyone already has everything--the utility of more consumption is increasingly marginal. 5. Understand the perspective of employers and marginalized workers. Most economists are safely inside the well-paid protected castles of academia or government, and so they have no real experience of being an entrepreneur or employer. They have no real grasp of how difficult it is to start a business or operate a business at a profit. Let's review these one at a time. As Gail Tverberg of Our Finite World has explained in great depth (Energy limits: Why we see rising wealth disparity and low prices and Overly Simple Energy-Economy Models Give Misleading Answers), as EROEI declines and debt rises, there's less economic output available to pay workers. In other words, the only possible output of declining EROEI and rising debt is stagnant or declining wages. As for fast-rising debt: debt is nothing but future spending brought forward. Future earnings must be devoted to paying interest and paying down the debt. That leaves less money available for spending in the future. How difficult is that to grasp? Apparently it is impossible to grasp, judging by the Keynesian Cargo Cult of Paul Krugman and his fellow Cargo Cultists, who are busy staring at radio dials painted on rocks and declaring that the answer to everything is more debt. The key feature of monopoly and state-cartel capitalism is ever-rising costs for everything controlled by monopolies, cartels or the state. Since these are the dominant structures in our economy, the cost basis of the entire economy rises even though output doesn't rise. In other words, we pay more for the same goods and services. Conventional economists may have an abstract understanding of business costs and regulatory burdens, but they have no life experience in actually earning a profit in a high-cost, state-cartel-dominated, globalized marketplace. Being well-educated and well-paid, they have minimal contact with real-world marginalized workers. I personally know numerous young men and women in their 20s who live at home and are effectively out of the labor force. They could work but choose not to, or they can only find part-time work that can't support an independent household or they scrape by on earnings in the gig economy or the black market. Whether economists care to measure this or not, the reality is many people choose not to work rather than take a minimum wage job that requires a long commute and hard labor. They consider it "not worth my time," demeaning, too difficult, etc. It's much easier to live at home and let Mom and Dad pay the bills, and make pocket money in the black market or from occasional gigs. Others are willing to work in minimum-wage jobs but they don't live near job-rich areas or they lack the cultural and social values and skills required by employers: for example, the ability to show up on time, get along with other workers, etc. There are few "easy jobs" in the private-sector economy. To eke out a profit, employers demand a lot of workers, from fast-food employees all the way up the chain to corporate managers. The reality is that modern work is challenging, requires multiple skills and a solid set of values. Many people lack the ability and/or will to function effectively in these conditions. From the employer's point of view, regulatory burdens and the soaring cost of labor overhead make it increasingly difficult to stay afloat. From the small cafe owner trimming workers' hours to global corporations laying off thousands of employees, the reality is that earning a profit is increasingly difficult for all but a handful of big-tech quasi-monopolies such as Google, Microsoft and Facebook. To hire someone at $15/hour, an employee must get at least $45/hour of value from each hour of employee labor. The employer has labor overhead costs--Social Security/Medicare, healthcare, unemployment, 401K/pension payments, liability insurance, etc.--plus the direct overhead of rent, production and the back office (accounting, regulatory compliance, etc.). Then there's all the taxes and junk fees that must be paid "because you business owners are rich and can afford it." 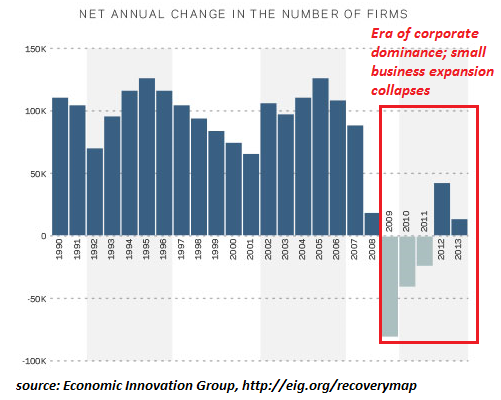 This chart shows the reality: new business formation is collapsing because it's an increasingly risky wager to start and operate a new business. The mainstream lauds the entrepreneur and the media glorifies a handful of tech billionaires, but for the bottom 99% of enterprises, it's a struggle that is increasingly not worth the risk, hours, stress, anxiety and hassle. At some point, for health and financial reasons, the only way to survive is shutter the business and lay off the employees. 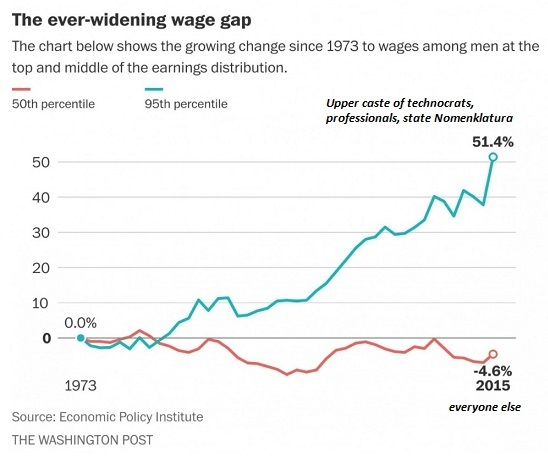 No wonder wages as a percentage of the economy have been declining for decades. Global corporations have the advantages of financialization and globalization, but everyone else is staggering under the weight of higher taxes, higher costs and heavier regulatory burdens. The only way to reverse declines in labor participation and stagnation in wages is to make it easier to start enterprises and hire people, and dramatically lower the cost basis of the entire economy. There is scant evidence that policymakers have any real interest in either of these goals or any knowledge of how to make them happen, despite the abundance of lip-service paid to "business-friendly" strategies. Thank you, David K. ($50), for your outrageously generous contribution to this site-- I am greatly honored by your steadfast support and readership.